AHMEDABAD, INDIA -- (Marketwired) -- 05/29/14 -- There are many things that set the Courtyard Ahmedabad apart from other hotels in Ahmedabad's rapidly growing S.G. Highway district. There are its executive lounge, O2 Spa and 7,492 square feet of state-of-the-art meeting space, for starters, which are hard to match. Then there are its luxurious guest rooms and exceptional dining options. But perhaps the most compelling feature of this quietly elegant hotel is its commitment to supporting its community, something it most recently demonstrated during a special event benefitting some of Gujarat's most underserved citizens: adolescent girls. On May 16, 2014, this business hotel in Ahmedabad welcomed a group of bright, focused young girls associated with UNICEF's Dare to Care initiative for a tour of the property. Dare to Care targets adolescent girls who are at risk for discrimination, exploitation and abuse and works to empower them by keeping them in school and encouraging them to avoid early marriage. As these girls toured the property, making note of the sleekly sumptuous lobby, refreshing outdoor pool and state-of-the-art business center, they eventually arrived at one of the most inviting cafes in Ahmedabad, the European-style Java+. Here they experienced what was possibly the most exciting encounter of their young lives to date: face-to-face time with cricket players from the Delhi Daredevils team. The Delhi Daredevils form one of eight teams that make up the Indian Premier League 2014 (IPL). 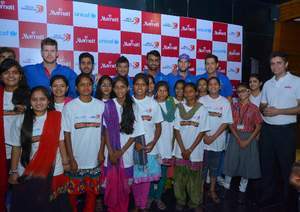 Marriott India and the Delhi Daredevils enjoy an official partnership, and the team also supports Dare to Care. The convergence of all these alliances on May 16 created one unforgettable day for those girls who visited the hotel. Players like Ross Taylor and Wayne Parnell spent an hour talking and laughing with the girls, many of whom come from tribal communities but who nonetheless follow the team enthusiastically and found inspiration in the concern their role models expressed for them. As one of the premier Ahmedabad hotels near the airport, this property was ideally suited to host the event between UNICEF and the Delhi Daredevils. Its sophisticated style and cosmopolitan clientele speak to a future these girls might achieve for themselves, given hard work and the right opportunities. And as part of Marriott India, the hotel embraces its parent company's "Spirit to Serve" by bringing attention to the plight of girls around India who deserve better. Few qualities are as distinguishing -- or as compelling -- as that. Courtyard by Marriott offers a refreshing environment that helps guests stay connected, productive and balanced. Intuitive services and design accommodate guests' needs for choice and control. With more than 860 locations in 30 countries, Courtyard is Marriott's largest brand. All Courtyard by Marriott hotels participate in the award-winning Marriott Rewards frequent travel program that allows members to earn hotel points or airline miles for every dollar spent during each stay.